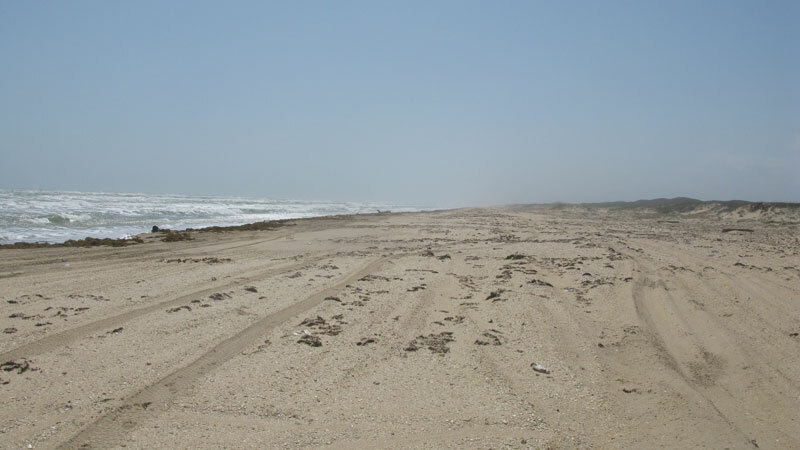 Stretching 80 miles along the Texas shore is Padre Island National Seashore, the world’s longest stretch of undeveloped barrier island. 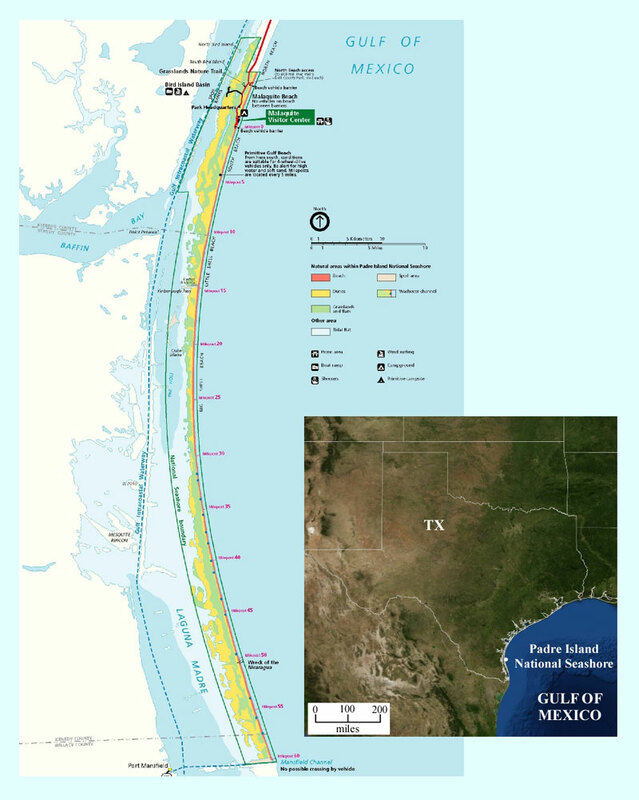 Padre Island is located along the Gulf of Mexico in southern Texas about 50 miles north of the US/Mexico border (Figure 1). In addition to being 80 miles in length, a large portion of the island is well over two miles in width and contains elevations up to 50 feet. 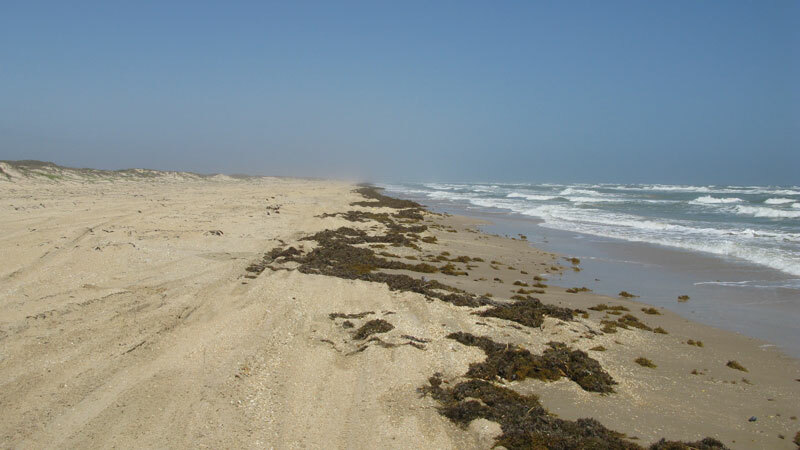 Because of its size, Padre Island National Seashore preserves many unique coastal environments, including complex dune systems, coastal prairie, wind tidal flats and a hypersaline (salty) lagoon environment known as the Laguna Madre. 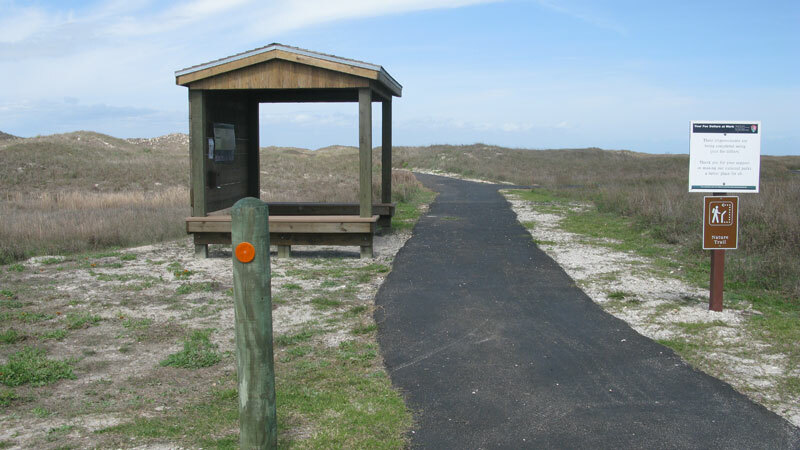 The dynamic dune system on Padre Island is quite impressive with dune heights up to 50 feet above sea level. The fore-island dune ridge system (high dunes running parallel to and just back from the beach) is the most continuous dune system on the island and also boasts the highest dune heights (Photo 1). Although these dunes are dynamic features shaped and reshaped by winds and storms over time, most of the dunes behind the fore-island dune ridge have stabilized due to the vegetation (Photo 2). 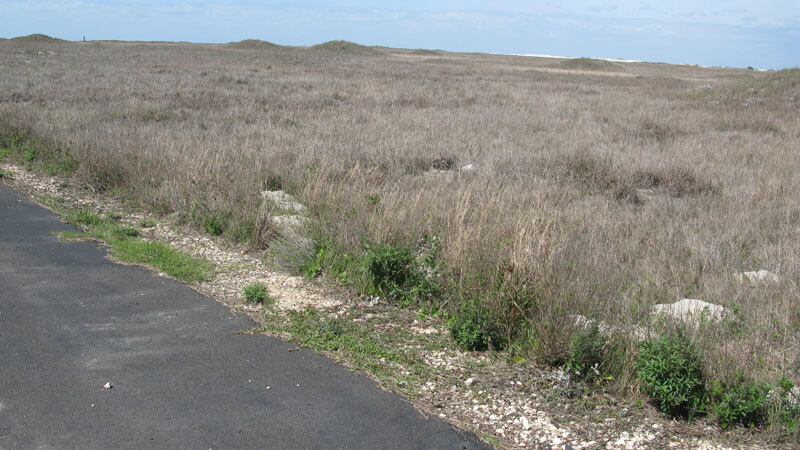 The coastal prairie (also known as grasslands) environment makes up the majority of the islands area, and consists of low areas and small ridges covered by vegetation. This part of the island is home to many plants and animals, including birds, reptiles and mammals (Photo 3). 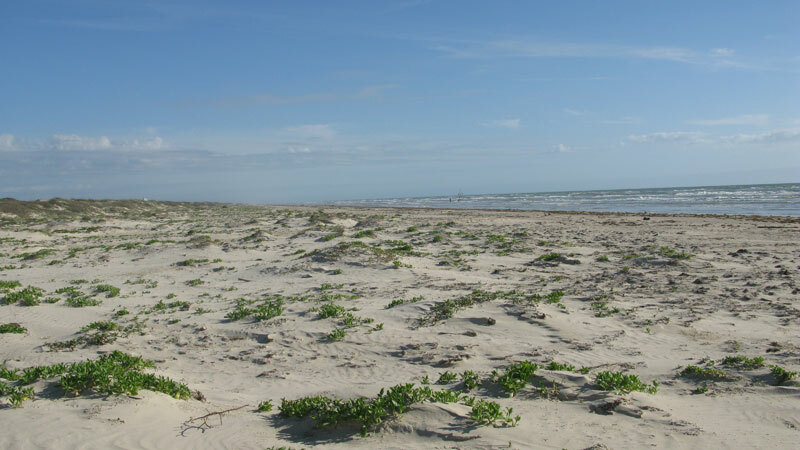 Two environments of Padre Island National Seashore that are closely linked are the wind tidal flats and the Laguna Madre. The Laguna Madre (Fig. 1) is a shallow hypersaline (salty) lagoon that separates the island from mainland Texas. The lagoon is extremely important both ecologically and economically, as it is the home to an enormous population of fish, shrimp, crabs and birds. 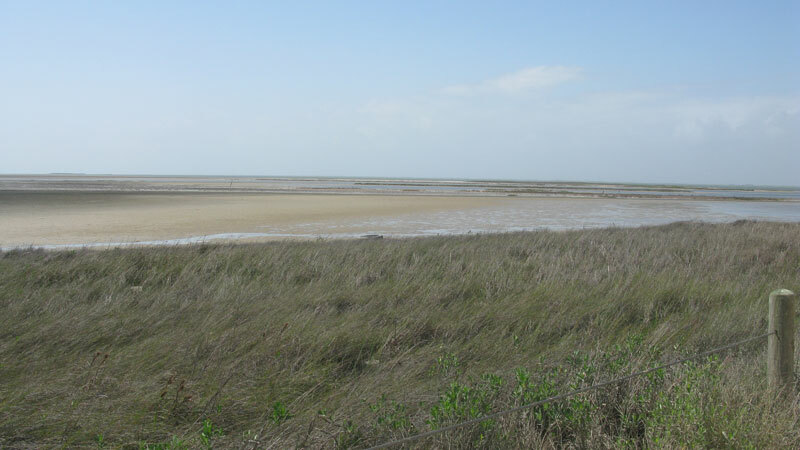 The wind tidal flats adjacent to the Laguna Madre are the island’s primary wetlands (Photo 4). These flats are only periodically flooded by northerly wind tides and therefore are dry for a large portion of each year. Although these ephemeral marshes may appear barren to the casual observer, this portion of the island is extremely biologically active. 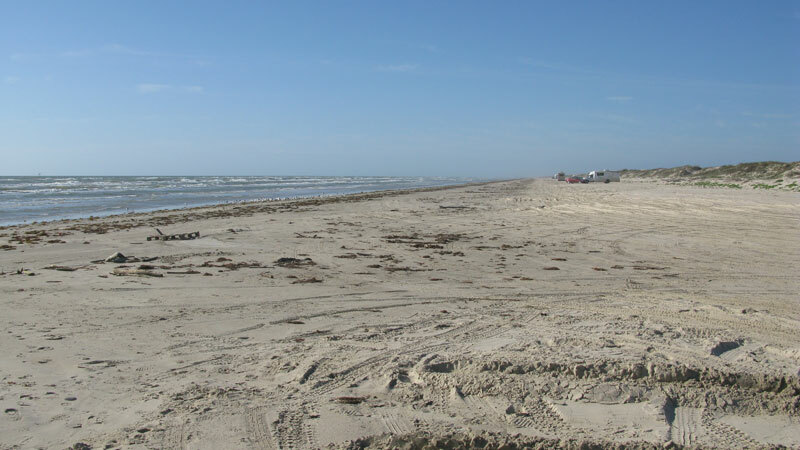 … The beaches of Padre Island are themselves unique because of the long stretch of uninterrupted coast that has not been developed….